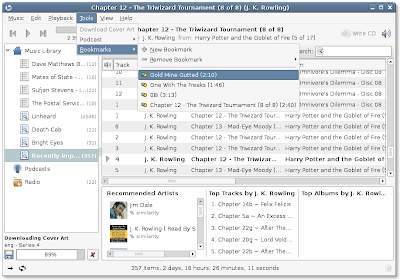 Banshee Bookmarks If you use Banshee to listen to audio books, lectures, or similar, you'll enjoy the new Bookmarks plugin I committed tonight. It will ship with Banshee, but be disabled by default. OLPC The latest build (368) is much faster, more responsive. I finally really played around with TamTam and eToys; what a blast! I also submitted my first patch to Sugar. Flourish There is a Linux conference called Flourish being held this weekend, April 6 and 7th, at UIC in Chicago. The conference is free if you register in advance. There will be speakers from Google, IBM, Red Hat, FSF, and Drupal. I'll be attending a couple of talks and the mixer (held at my office), and I'll bring my XO and Neo1973. Would be better if Bookmarks were a top level menu like it normally is in most applications. I considered making it a top level menu, but didn't since it's not nearly as common of a thing to use in a music player compared to a browser. But that decision is not set in stone. And yes, they make note of your position within the file. You could take a leaf out of Epiphany's book and organize bookmarks under topics (such as genre, or artist, but also user-specified). This is what I'm looking for. I'm an Ubuntu noob coming from Windows. I like the 'resume' feature built in Itunes. How do I get this bookmarks pluggin? I don't see it listed in my Banshee installation. You can get the bookmarks plugin in the latest Banshee release, 0.13.0. The plugin itself is actually compatible with much older versions, too. See http://banshee-project.org for more details.